Snails in the wild eat a variety of food and are pretty much omnivores which means they eat plant/vegetable and animals. Snails eat a variety of products including dead animals that may have died in the water, decomposing litter and leaves from their area and more. A little goes a long way so be sure not to overfeed.. 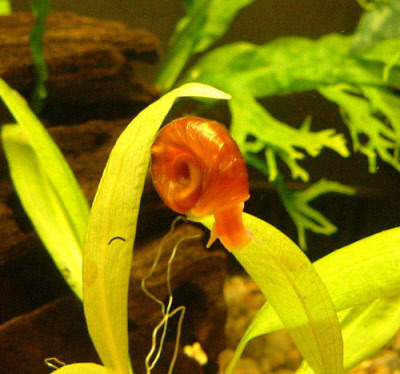 The Ramshorn loves to eat algae and decaying matter which will help keep your fish tank or bowl much cleaner. Feed your snails everyday. If you notice there is leftovers after a few hours your may be overfeeding. In a freshwater aquarium environment overfeeding can result in an increase in ammonia, nitrates and nitrites which would not be goof for fish or snails currently living in your habitat.